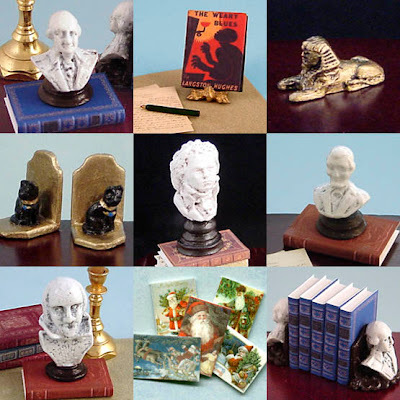 I'm excited about the new statuary I've added to my store - perfect classic accents for your miniature dens and libraries! Shakespeare, Beethoven, Lincoln, and Washington, all handpainted and ready to grace your mini desktop. Or if Egyptology is your thing, then check out the tiny golden Sphinxes or Egyptian Cat Goddess bookends. I've also added some new Lincoln bookends (no photos yet), new books (including The Weary Blues by Langston Hughes, pictured below), and new Christmas minis. And don't forget, there's still one more day to get entered for the drawing to win a $15 shopping spree at TreeFeathers Miniatures! Well apparently I'm not the only one who has wished for more interesting miniature floor tile! I'm adding this second post about flooring to include some suggestions from the comments on the last post, as these sources should be on your reference list. Richard Stacey's Miniature Brick & Stone Products was suggested by Debbie of Tiny Treasures. Their miniature stone tiles are cut from genuine materials - real marble, real slate, real brick - and are offered in several scales. They also have siding and roofing supplies, as well as kits, patterned finishing papers, and peel-and-stick tiles. What I love about their stones is the wide variety - we're not just talking bricks and plain floor tiles (although they have those, too) - they've got cobblestones, "crazy paving," ceramic tiles, pebblestone, genuine marble tiles, large patio pavers, and even miniature curbstones! The next suggestion, from Rosanna at la stanza di giuggiola, is Le Miniature di Eurosia. This Italian site (translation provided) makes ceramic and terra cotta products, including some nice pottery and garden accents (also be sure and look at their roomboxes and flowers while you're there.) They provide extensive instructions for working with the tiles, and templates for various layout patterns. 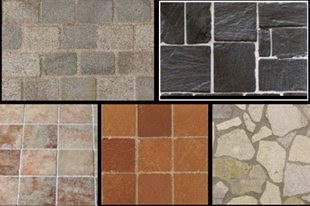 Their tiles are great - an assortment of plain terra cotta tiles in a variety of sizes and shapes, as well as a large selection of beautifully decorated specialty tiles. They even have coordinated tile sets, with primary and accent tiles as well as borders all picked out for you. I've been working on a project recently that requires tile floors. Since painting faux marble is not my strong point, and I also figured it would take me more time and materials to make them from scratch, I set out on the web in search of miniature marble tiles. I quickly discovered that most of the full-service miniature shops on the internet all carry the same few lines of tile. Primarily those made by Model Builders Supply, which are very nice sticky-back tiles in a nice marble pattern, but they only come in a few colors (none of which were what I wanted, of course.) The other options are limited selections of plastic sheets and such, in a few basic colors. Not too exiting. I figured I was stuck with dark green marble that was going to clash with everything else, or else I was in for a big mess of plaster and paint as I tried to come up with my own. But, never fear - I found two great sources for beautiful, unique tile that will make your dollhouse stand out! The first is Earth & Tree Miniatures, located in Amherst, NH. I used to live near them, and they're one of my favorite miniatures shops. A huge selection, and the best service around - they really go out of their way to take care of their customers. (Disclaimer - I don't work for them, I've just purchased from them a lot.) So it should have been no surprise to find that they have a great selection of floor tile. 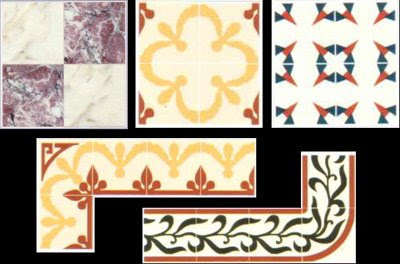 The first interesting line is by Old World Tile. These prefinished floors reproduce the look of old world style (natch) in a variety of stone, brick, and tile patterns. They are beautifully printed on some type of thin foam board. I'm not sure what it is exactly, but I've seen them at shows (and met their creator, Beth, very nice lady) and they are wonderful and look very realistic. I've had the Stone Diamond Floor on my wish list for ages! Each one comes with a stylus that you can use to indent the grout lines, bringing the whole thing into relief. They come in 10"x16" sheets, so you can trim to fit and glue into place. The second interesting line at Earth & Tree is by Miniature Corner. First off are their Checkerboard Marble Tiles, which come in several pretty color combinations. They also make Mosaic Floor Tile sheets, that have been pre-punched so they can be easily separated into individual tiles and then laid in as usual. 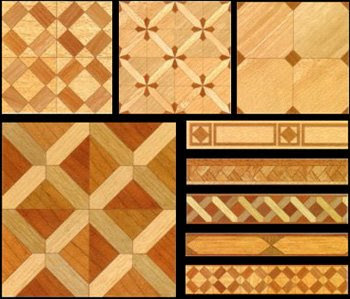 And if you like the look of wood parquet, they have Parquet Floor & Border Tiles which are printed on laminated cardboard. I've never seen any of this company's tiles in person so I don't know what the quality is like, but I'd like to try them out as they are all very attractive. The other company I found is called Tierneys Tiles. 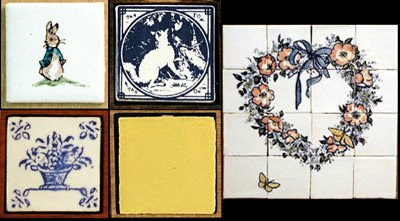 They make real miniature ceramic tiles in sizes from 1/8" to 2" and in a variety of shapes. They have a rainbow of basic colors to choose from, but the real treat is their handcolored specialty tiles: Swedish, Dutch, and English patterns; storybook and alphabet accent tiles; fireplace hearth murals; floral, fruit and seasonal tiles; Art Deco and Southwestern themes. They're all gorgeous. I want to collect the whole Aesop's Fables line!